Extech recently introduced a new addition to their line of handheld borescopes, the BR80 Video Borescope Inspection Camera. The new Extech BR80 offers a 17mm camera head on a 1m long probe, both rated as water and dust proof (IP67). At the tip of the probe the BR80 features four bright LED lights with adjustable brightness to give the best illumination in all situations. For those applications that require more reach, the BR80 is capable of accepting two 0.95m extensions, for a total possible working length of 2.9m, or 9 feet 6 inches. The BR80 has a good focal depth with a glare-free focus from about 2″ away, while the camera offers a total pixel resolution of 640×480. To make the borescope more ergonomic from a user perspective, Extech has incorporated a “flip” feature which will mirror the image vertically. For better battery life, the BR80 has a user selectable auto shut off delay, and the 2.4″ color LCD incorporates a battery status indicator. 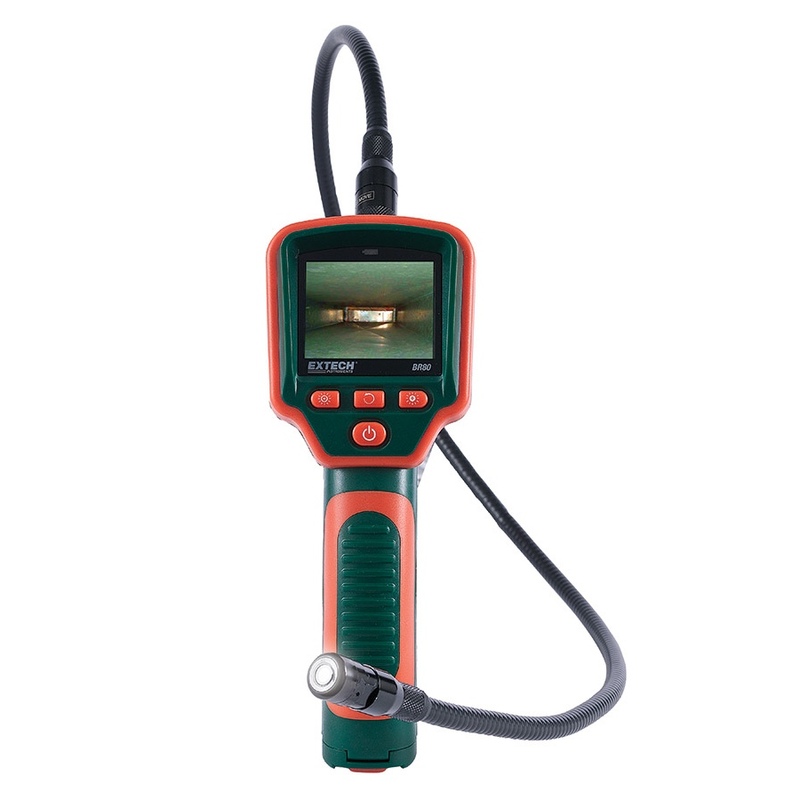 The Extech BR80 Video Borescope Inspection Camera makes a great choice for most general video inspection needs, from building inspections to mechanical applications. While we could wish for the ability to capture images or record video, it’s probably too much to ask in this price range. And price is probably the real news here–at $129.99, the Extech BR80 is an outstanding value, and will be a contender in the entry level borescope category.